Hi, my name is Luc. 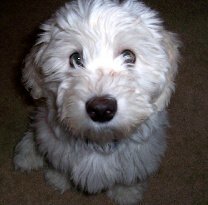 I am a Coton de Tulear dog. I know it’s quite a mouthful. My human gets pretty frustrated when people ask her about me and they just give her that blank look when they hear the fancy name. Please don’t let the name fool you – I might have a fancy name and fancy papers, but I am a pretty down to earth kind of dog. My needs are pretty basic – food, sleep, play, love. What a life – how lucky am I? Some people say I am expensive – but I think I’m worth it (if I do say so myself). I mean have you seen me? I am sooooo cute, plus I don’t shed and I’m very smart so I house train fast and learn how to be a well behaved dog pretty easily. I’m easy to get along with – I am very friendly and gentle and I like just about every human and every animal I’ve ever met (but if you come into my house be prepared for some barking because I have to protect my human – don’t worry, though, I won’t really hurt you). I am pretty adaptable – I can keep up if you want to go for a run in the park or I can be just as happy cuddling on the couch. Just don’t put me in the garage or out in the yard by myself. I am part of the family and I need to be with my humans. I have a beautiful soft coat and I love to be brushed (except when I get matted from rolling in the grass down by the lake - ouch!). My human keeps my hair short in a puppy cut which works great for me since I live in Florida and man is it ever hot here. I get to go to the groomer every month for “the works”. I don’t mean to brag, but I am pretty darn handsome when I leave that place. If you are looking to see if I am the right kind of dog for you (well, not me personally since I already have a human) check out this site – browse around and enjoy. If you are already friends with a Coton de Tulear, please share your stories with others so everyone can see how great we are (once again, I’m not bragging, just stating the obvious). Click here to see more pictures of me.